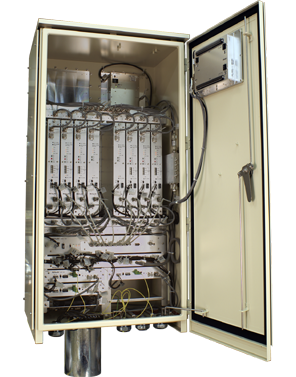 This system is a minimal low signal power transmitter for the relay of ISDB-T Digital Terrestrial Broadcasting. As the need arises, it's possible to have the compensation function built-in for integrate-type basic equipment. 6種類の基本装置をご用意しております。6 kinds of basic equipments are available. 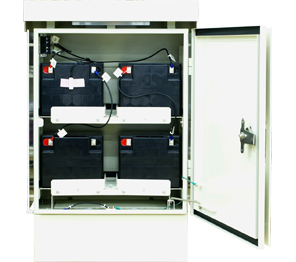 送信部と電源部を別筐体に分離しています。 Transmitter unit and power supply unit is separated and stocked in the respective steel cases. 送信部収容箱へは、最大で、一体型基本装置8メディアと、受信3系統・送信3系統が実装可能です。 Transmitter unit store box can mount 8 one basic equipment configuration, 3 systems of reception and 3 systems of transmission at maximum. 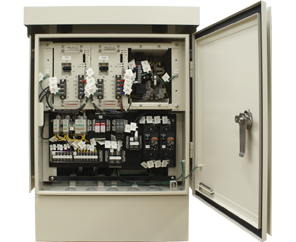 送信部収容箱は、分離・非分離方式(*) に対応しています。 Transmitter unit store box corresponds to both ways of isolated or non-isolated reception. 電源部は、耐雷トランスを標準装備し、蓄電池用の充電器を装備できます。 Power supply unit can be equipped with an lightning protection transformer as the standard and equipped with a charger for accumulators as an option. 電力増幅部は、「広帯域 MCPA」 による共通増幅方式を基本とし、1波あたり 50mW 出力を標準としています。 Power amplifier adopts common amplifying system by "broadband MCPA" and makes 50mW output standard per 1 wave. 周波数基準信号は、GPS校正型OCXOをオプションでご用意しています。 GPS calibrating type OCXO as a frequency reference signal is available as an option. Intermediate frequency adopts an original frequency for the purpose of miniaturization of equipment and price reduction. It isn't 37.15MHz as the small-scale relay station intermediate frequency prescribed by Orange Book (Japanese Standard of ISDB-T Digital Terrestrial Broadcasting).